New Delhi: Foreign-owned telecom firms will be allowed to bid for spectrum to operate so-called third generation (3G) phone services without a local partner, a bid document released by the department of telecommunications (DoT) has said, clearing confusion on the issue with different sections of the Union government holding varied views on it. With a 3G-enabled phone, a user can surf the Internet, download music or watch video helped by the high data speeds the technology enables. Spectrum refers to the airwaves used to complete a mobile phone connection. Telecom minister A. Raja expects to raise some Rs40,000 crore from the auctions. The bid document in the form of an information memorandum is available on DoT website ‘www.dot.gov.in’. DoT’s decision, said one expert, will make foreign players a bit more comfortable about participating in the bidding scheduled for mid-January. “This has been done as many of the foreign players were apprehensive about the fact that there was not enough time between the auction and the application to get the Indian subsidiary or joint venture together," Mahesh Uppal, director at telecom consulting firm Com First (India) Pvt. Ltd said. Firms such as AT&T Inc., Deustche Telekom AG and Qatar Telecom QSC are among international phone firms that have expressed interest in India but they have not specifically expressed interest in 3G. DoT has proposed to auction spectrum for 3G purposes in the 2.1GHz band while for auction of broadband wireless licence rights, spectrum will be allocated in the 2.3GHz, 2.5GHz bands. “A bidder can only bid for one block of spectrum that is up for auction and whatever spectrum is available will be auctioned and there will not be any waiting list," R.P. 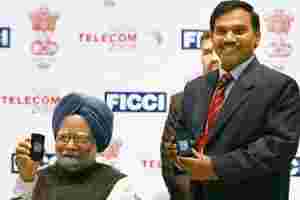 Agarwal, wireless advisor, DoT, said on the sidelines of an industry event in New Delhi.